If you’re between the ages of 9 and 14, you’ve probably experienced peer pressure. Peer pressure is when a person feels like they should do or not do something in order to fit in or be accepted by their friends or peers. Sometimes peer pressure can be a good thing when it encourages us to try something new or make a healthy change, but there are also times when a person can feel pressured to do something more risky or make a decision that could be harmful to their self or to others. That’s why it’s important to make sure your decisions are right for you based on what you think and try not to worry so much about what others are doing. 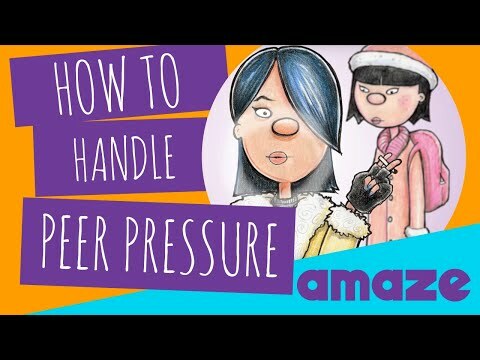 Peer pressure is when your friends or peers try to persuade or pressure you to do something. Peer pressure can be positive like when someone is feeling pressure to study more to improve their grades, to exercise more or eat healthier foods. It can also be negative when it involves something unsafe or possibly dangerous like lying, stealing or drinking alcohol. Situations involving peer pressure can be anything from how to spend your money to what to wear or not wear to how to act in different situations. Sometimes peer pressure might be easy to spot such as a friend pressuring you to do something or go some place you don’t want to. Other times it can be more subtle and be a feeling you have about how kids in your grade dress, act or behave. Peer pressure can be a powerful force sometimes to encourage us to make healthy choices, but other times it can involve risky things like smoking, drinking, experimenting sexually before we’re ready, cutting class, breaking curfew, stealing, etc. Find an example of a situation in which a tween or teen was feeling pressure to do something and talk about it with your child. It can help to set up a code word or text that your child can communicate to you if they are ever feeling uncomfortable or unsafe and need your help leaving the situation. It can also help to give them permission to always use you, their parent or guardian, as an excuse about why they can/can’t do something. These strategies allow your tween to not look silly in front of their friends while also making healthy decisions.